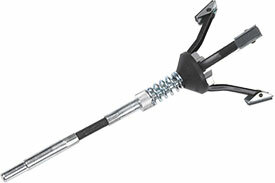 The GearWrench Brake Cylinder Hone is designed to hone drum brake wheel cylinders and disc brake calipers from 3/4'' to 2 1/2'' (19mm to 64m) in diameter, the sleeve makes insertion in cylinder easy and protects stones when not in use, use with a variable-speed drill, and use 2004D Stone Set for disc brake honing and 266 for Drum Brake Honing. GearWrench replacement stones for converting 3 legged 265D or 2544 cylinder hone to disc brake hone; Size 400, 3/4''. GearWrench replacement stones for 265D or 2544 drum brake cylinder hone; Size 320, 1 1/8''. GearWrench economy brake and engine cylinder hone set. GearWrench replacement part, three 2'' Cylinder Hone Stones. The 265D GearWrench Brake Cylinder Hone is one of thousands of quality tooling products available from MRO Tools. Please browse GearWrench Brake Hone Tools for tools similar to the 265D GearWrench Brake Cylinder Hone. 265D GearWrench Brake Cylinder Hone description summary: GearWrench brake cylinder hone. Quantity discounts may be available for the 265D GearWrench Brake Cylinder Hone. Please contact MRO Tools for details.